A very possible, but frustrating process, is cutting/shaping interior radius on flat bar and sheet stock. 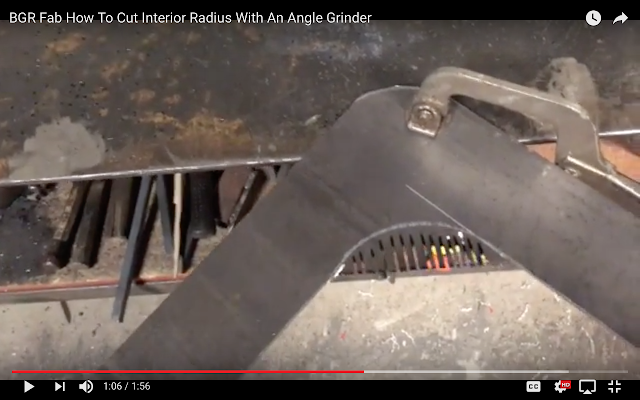 If you are frustrated with the constant vibration and time consuming process of cutting interior radius with your angle grinder, this simple tip may make the process more bearable. If you are new to metal fabrication, and would like to get started, below are a few reasonably priced tools you might want to look at. Also, below you'll find a few more videos that may help you get started in the basics of fabrication.You may also find it entertaining and beneficial to subscribe to my Youtube channel. Then you can continue to learn and better your skills as I continue to learn and better mine as well. A basic, inexpensive Angle Grinder that has a unique feature. This angle grinder is a good option for a beginners unit. It is light weight, and easy to handle. It also comes with a twist handle that is very convenient to use in many different positions. If you think that your grinder is going to be harshly treated though, you may want to look at one of the 2 angle grinders listed below. Here are 2 Angle Grinders that I have had and used. All of which I find to be very durable, and worth their price. This Makita Grinder is their budget grinder. It's a bit lower powered than the more expensive Makita Angle Grinders, but it's a solid unit. I used this grinder in Chile, S.A. in the rain for a good two years, and it was going strong when I sold it. While this Metabo is twice the price. It is a very solid unit, and I've used a number of them over the year in many different industries. While I can say all of them would endure the same abuse, I have seen them dropped and shatter the casing, and then turn right one and function like normal. So, if you have the money to spend on a good beginners angle grinder, this one is a good option in my mind. Metabo also offers more expensive versions with more power and features. If you would like to check out the welder that I chose for my fabrication needs when starting back over here in the U.S., then check out this video here. As always, thanks for stopping by, and please don't forget to like, comment, and subscribe! This is nice post! I have an angle grinder that I used with a cutting metal but didn't know what other attachments were good for. Thanks for your nice video. This angle grinder drill machine is the port of power tools used to drill woods, metals, walls etc. This is one of the powerful drill.